No one knows better than independent grocers how fiercely-competitive the supermarket industry is. To help store operators and their associates best serve their shoppers, NGA has developed numerous ways to train employees, be one step ahead of the competition, and ultimately stay ahead of the rapidly-changing consumer trend curve. Have you seen the new Lidl stores appearing around the country? Want to view other supermarket layouts? Through a partnership with the Coca-Cola Company, NGA members have complimentary access to more than 212,000 photos of nearly every supermarket across the country through PlanetRetail RNG. This includes access to retail news and list ranking reports, as well as a quarterly insights and trends webinar series. Click HERE to log into your NGA member profile and click ‘RNG Portal’ on the left menu to access the portal. Each Wednesday, NGA hosts hour-long webinars featuring the latest industry trends, the most recent federal regulations, consumer insight reports, and much more. Registration is complimentary for NGA members and webinars are typically offered weekly at 2 p.m. ET. To view a calendar of upcoming webinars, click HERE. Looking for ways to accelerate your learning? The NGA Online Training and Education Center, a professlional development platform supported by the Coca Cola Company, provides more than 100-specific online courses divided into nine different libraries. Best of all, thanks to a partnership between the Retail Learning Institute (RLI) and the University of the Cumberlands, some courses count as college credit toward an Associate of Science Degree in Business – Retailing from the university. In 2016, 24 new courses were added to the program, such as strategies to improve retention, facility management, and the business ethics. In 2017, another 13 were added, including employee sexual harassment, display and storing, and mastering management. Take advantage of the program HERE. The Retail Management Certificate is a nationally recognized, accredited college program developed by retail industry experts and community college leaders to prepare retail employees for positions in management. NGA members interested in giving associates the necessary skills to advance their career in the supermarket industry can complete the program in as little as one year. Classes are offered online nationally and on campus at certain approved community colleges. To learn more about the program, click HERE. NGA member companies are invited to participate in the association’s share groups, a professional peer group of independent grocers that provide the opportunity for industry operators to meet in person, problem-solve, swap ideas, and help non-competing industry partners. Current share groups include next generation leaders, marketing, human resources, loss prevention, and ESOPs. Share groups are entirely participant-driven, professionally facilitated, and generally meet two times annually. Their success is driven by members openly sharing thoughts and being committed to each other’s success. To learn more about NGA share groups, click HERE. 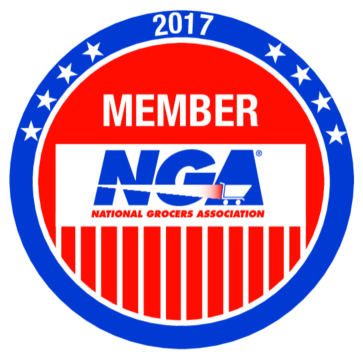 For more information on NGA membership, contact Tom Dozier via email at tdozier@nationalgrocers.org.